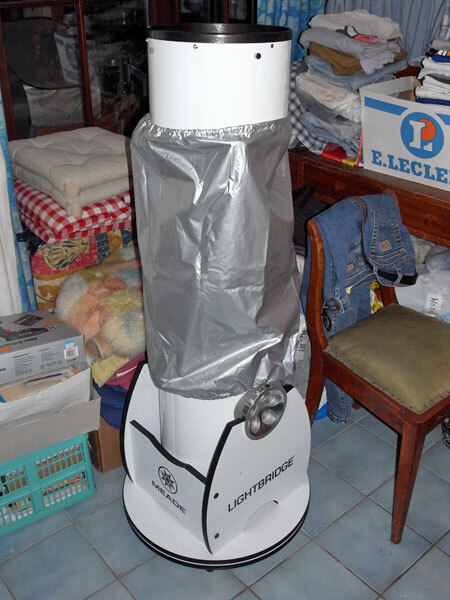 On this page, I present some information about my Meade LightBridge 10" Dobson telescope (purchased in October, 2009). 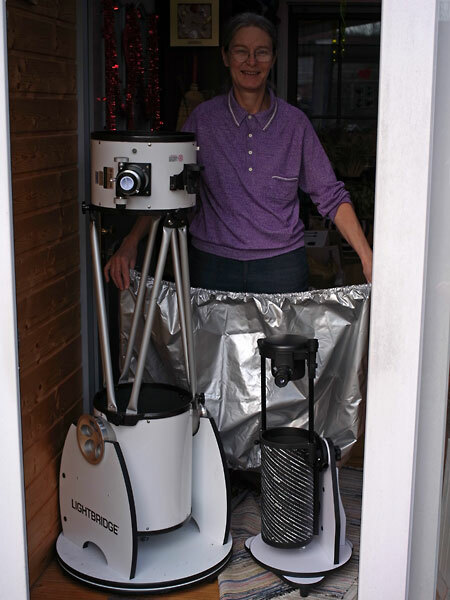 The basic data for this telescope (and its siblings) was collected from the Astrocom Website (www.astrocom.de), the company where I bought the telescope (it no longer sells telescopes). Note: I sold the telescope in March 2016 (see below). I therefore can no longer report any experiences with this scope here. 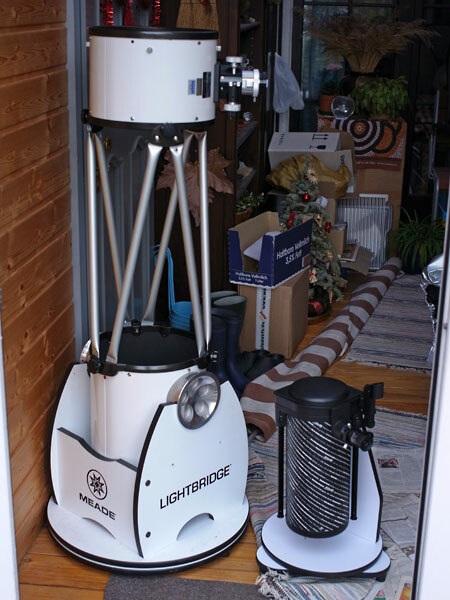 Why did I buy the Meade LightBridge 10" Dobson telescope and for what purpose? After owning the Meade ETX-90EC for about 10 years with some highlights, but also many failures, I finally wanted to get into astronomy a bit more seriously in 2009. For this purpose, I wanted to have a telescope that was universal and simple and that could give me access to as many sky objects as possible. And this meant that it should have as large an aperture as possible - one that I could just manage in terms of weight. An opening of 10" seemed to me ideal for this purpose (even though 6" and today more 8" telescopes are regarded as "beginners' devices"). 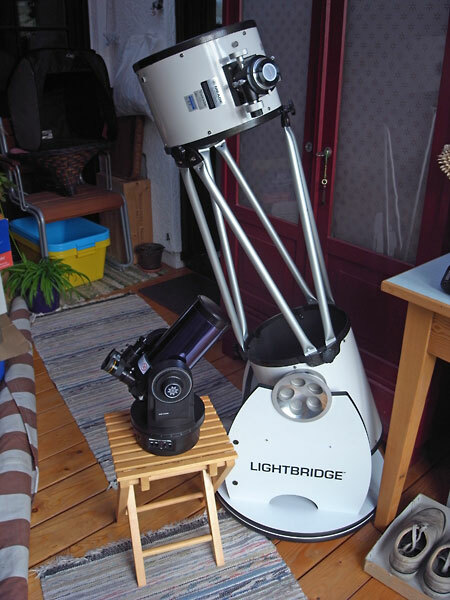 Since I was a "Meade fan boy " and had also been looking for Dobsonian telescopes a lot, an offer from Astrocom for a Meade truss Dobsonian telescope, a Meade 10" LightBrige, which was reduced by 100 EUR, seemed just right to me. The top row shows views of my 10" Dobson telescope (left: with stray light protection, center: size comparison with Meade ETX-90EC). Then, there are some comparisons with my 5" Dobson Heritage P130. 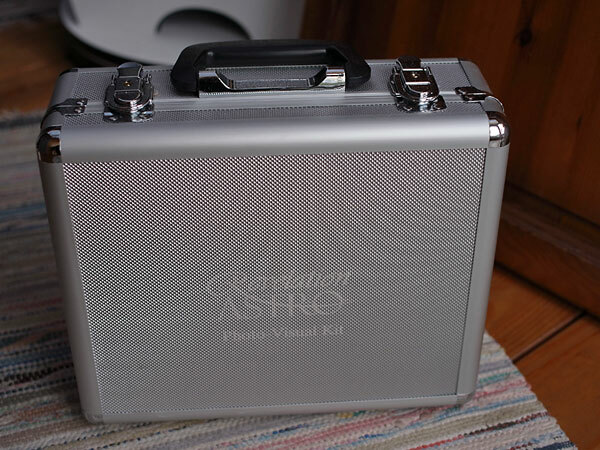 The bottom row also shows my Revelation eyepiece suitcase, which I bought to complement the telescope (10" Dobson and suitcase were bought from Astrocom - the telescope was a demonstration sample). 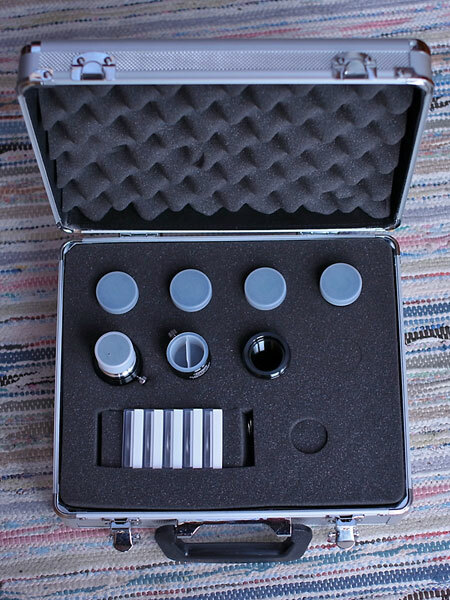 The Revelation eyepiece suitcase contains 5 Plössl eyepieces 1.25" (9 mm, 12 mm, 15 mm, 20 mm, and the highly praised 32 mm Digi-Scope eyepiece), a 1.5 x/2 x Barlow lens, a moon/gray filter, 4 color filters for planet observations (colors: #11 yellow-green, #25 red, #47 violet, and #82A lightblue) and a 1.25" photo adaptor with T2 mount (M42 x 0.75 mm). Resolving Power (arc secs) 0.56" 0.45" 0.38" 0.28" 1.51" 1.15" 1.01" 0.9" 0.77" 0.58"
The Meade 10 "Dobson telescope yielded the best results of all the telescopes that I have owned so far, regarding the Moon, the planets, as well as the few nebulae that I have observed. Due to its high magnification (because of the long focal length) and its large aperture (10 "= 25 cm) this was to be expected. The difference to the Heritage P130 was, however, not as large as I had expected. 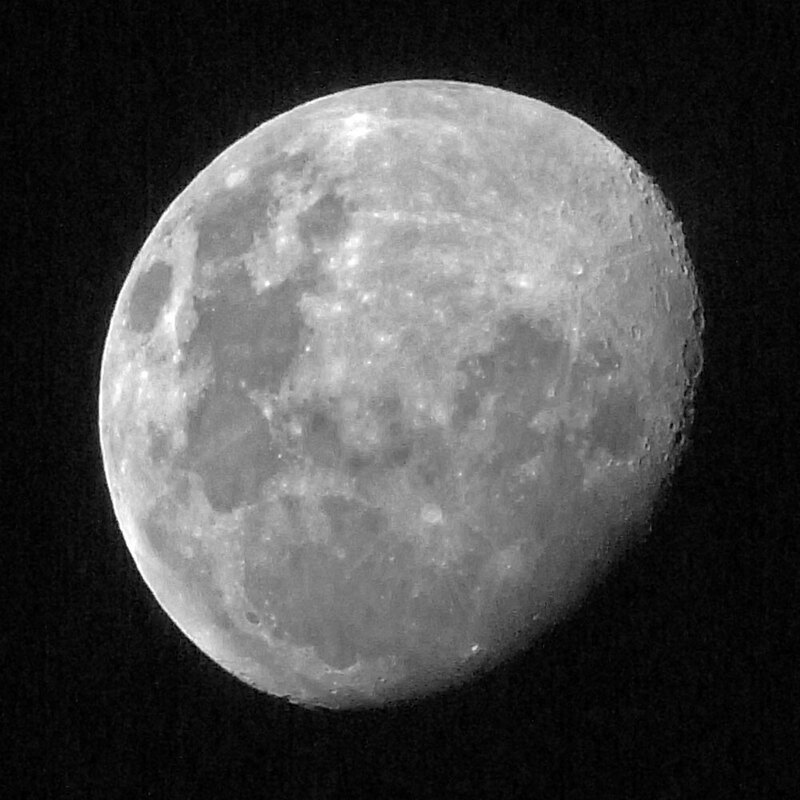 Perhaps my expectations as to a telescope of this aperture and quality were too high, especially since the observation conditions (the "seeing") were not always the best, (I struggled a lot with air turbulence, in particular). Maybe I should have bought a collimator earlier, but I just did not dare to adjust the scope for a long time... Actually, the telescope did not appear to be really maladjusted, when I checked it with a laser collimator for the first time. Moon photos turned out pleasingly sharp, and the planets Venus, Jupiter, and Saturn could be easily observed with the eye in some detail (crescent, stripes, moons, ring; I was not able to recognize the Cassini division in the Saturn ring, maybe the air turbulence was too high). The latter was especially true after I finally tried to adjust the telescope (which I did in 2015, a long time after the purchase of the telescope). Note: Regrettably, I cannot post any further impressions on this telescope here, because I sold it in March 2016 due to the high weight of the assembled optical tube (over 17 kg). Only with difficulty, I was able to carry the tube with my "damaged" and, later, "repaired" hips. Comparison data for the Meade LightBridge Dobson telescopes can be found on this Website: Search for Meade Dobson telescopes, select the respective telescopes for comparison, and call the comparison page by pressing a button.